Watch This Fan-Made Video Of Melanie Martinez’s “Mad Hatter” for Mad Hatter Day! Like many, I have long adored Disney’s adaptation of Lewis Carroll‘s Alice’s Adventures in Wonderland. Walt & co. perfectly encapsulated the kooky, uber-sarcastic world of Alice’s mega daydream (and it was shortened to Alice in Wonderland in 1951). Today it still holds its place as a childhood fave turned cross-generational cult classic. This year also marks the 150th anniversary of the Carroll’s most famous contribution to literary arts. Currently at The Morgan Library & Museum in New York City, there is an exhibit that explores “the genesis” and development of one of the most bizarrely charming children’s fiction books. (In my humble opinion, it indirectly influenced later similarly unconventional works such as The Phantom Tollbooth and far-out yet sensitive material of the quiet genius Shel Silverstein. The Morgan Library even got the original Carroll manuscript of Alice’s Adventures in Wonderland for display. (The exhibit closes on Monday, October 12. 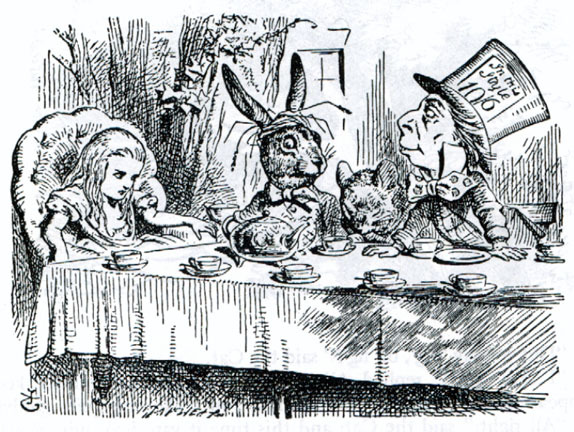 October 11 for the original copy of Wonderland). Also, if you haven’t heard Melanie Martinez’s “Mad Hatter” track, one of the best from her debut and thematic album Cry Baby, today is the definitely the day to press play on it! Martinez uses Wonderland references in defense of unorthodox personalities. The song just bounces with colorful confidence! She hasn’t released it as a single, but there are fan-made videos for it online. Below is one uploaded by Lucas Felipe and it features clips from the Disney version. Afterwards feel free to watch Johnny Depp play the Hatter, re-imagined as “Tarrant Hightopp” in Tim Burton’s live-action version from 2010. Previous Previous post: Why Did Cosmopolitan Call The Kardashians ‘The First Family’?